Lasers have various periodontal applications including calculus removal (Er: YAG, Er, Cr: YSGG lasers); soft tissue excision, incision and ablation; decontamination of root and implant surfaces; biostimulation; bacteria reduction; and osseous surgery. This paper reviews some of the major opportunities for using lasers in periodontal and implant specialty practices. The literature relating to the use of lasers for removal of the pocket epithelium, root conditioning, bacterial reduction and decontamination of infected implant surfaces is discussed, and a summary of the advantages and disadvantages of using lasers for periodontal treatment is provided. Large proportion of Asian populations have moderate to severe periodontal disease and a substantial number are anticipated to be at high risk of cardiovascular diseases (CVD). This study reviews epidemiology and association of periodontal and CVDs from the South-Asian region. Observational studies and clinical trials published during January 2001–December 2012 focusing association between periodontitis and CVDs in South-Asian countries were retrieved from various databases and studied. Current evidence suggests that both periodontal and CVDs are globally prevalent and show an increasing trend in developing countries. Global data on epidemiology and association of periodontal and CVDs are predominantly from the developed world; whereas Asia with 60% of the world's population lacks substantial scientific data on the link between periodontal and CVDs. During the search period, 14 studies (5 clinical trials, 9 case–controls) were reported in literature from South-Asia; 100% of clinical trials and 77% case–control studies have reported a significant association between the oral/periodontal parameters and CVD. Epidemiological and clinical studies from South-Asia validate the global evidence on association of periodontal disease with CVDs. 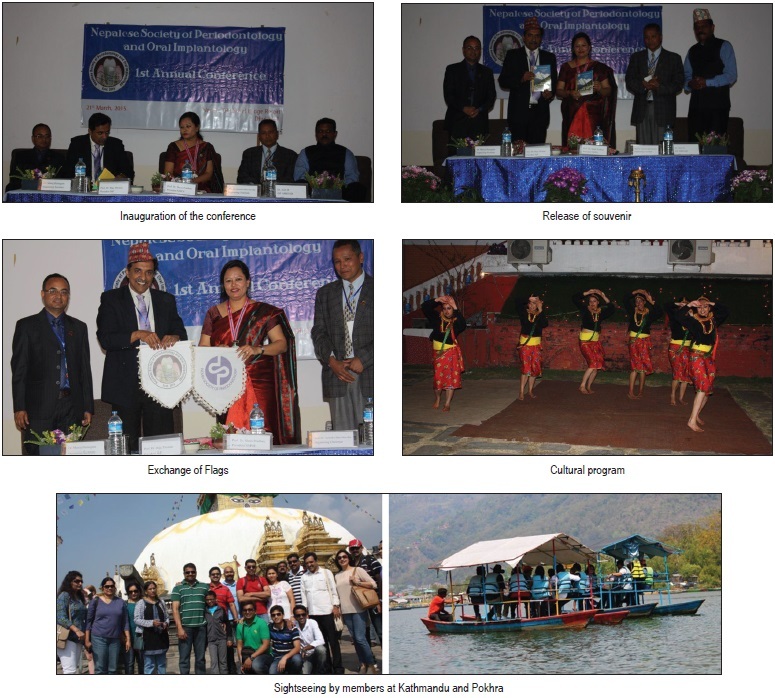 However, there is a need for meticulous research for public health and scientific perspective of the Periodontal and CVDs from South-Asia. Aim: Vitamin D is associated with inflammatory diseases such as periodontal disease and diabetes mellitus (DM). The aim of our study was to find out the level of serum Vitamin D in chronic periodontitis patients (CHP) with and without type 2 DM. Materials and Methods: This study consists of 141 subjects, including 48 controls. 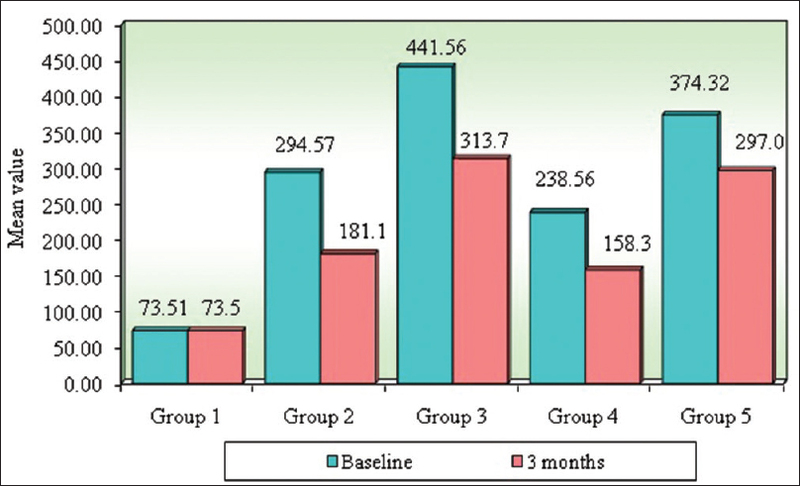 Case groups consisted of 43 chronic periodontitis patients with type 2 DM (CHPDM) and 50 CHP. pocket depth (PD), clinical attachment loss (CAL), modified gingival index (MGI), plaque index (PI), and calculus index (CI) were taken. Serum 25-hydroxyvitamin D (25[OH] D) level in ηg/ml was estimated by electrochemiluminescence immunoassay with Elecsys and cobase e immunoassay analysers(cobase e 411). Other laboratory investigations including fasting blood sugar (FBS) and serum calcium were measured in all subjects. Results: The mean serum 25(OH) D level was 22.32 ± 5.76 ηg/ml, 14.06 ± 4.57 ηg/ml and 16.94 ± 5.58 ηg/ml for control, CHPDM and CHP groups respectively. The difference was statistically significant (P < 0.05). The mean value of FBS was significantly high in CHPDM group as compared to CHP group. Periodontal parameters like MGI, PI, PD, and CI showed significant difference between groups (P < 0.05) and higher score was found in CHP group, while CAL and PI showed no statistically significant difference between CHP and CHPDM group (P > 0.05). Conclusions: This study observed a low level of serum Vitamin D level in patients with CHP and CHPDM. Low Vitamin D level was observed in case groups may be due to the diseases process rather than low Vitamin D acting as a cause for the disease. Background: Major depressive disorder (MDD) has been associated with changes in behavioral, neurophysiological, and neuroendocrinological factors and thought to be one of the leading causes of disability worldwide. There are various evidences that depression and periodontitis may also be related.Aim: The aim was to evaluate the association between MDD and periodontitis in a convenience sample of hospital outpatients. Materials and Methods: Sixty individuals (30 subjects with MDD and 30 subjects without MDD) of age 26–67 years were included in the study. Depression was assessed by means of structured clinical interview for diagnostic and statistical manual of mental disorders. 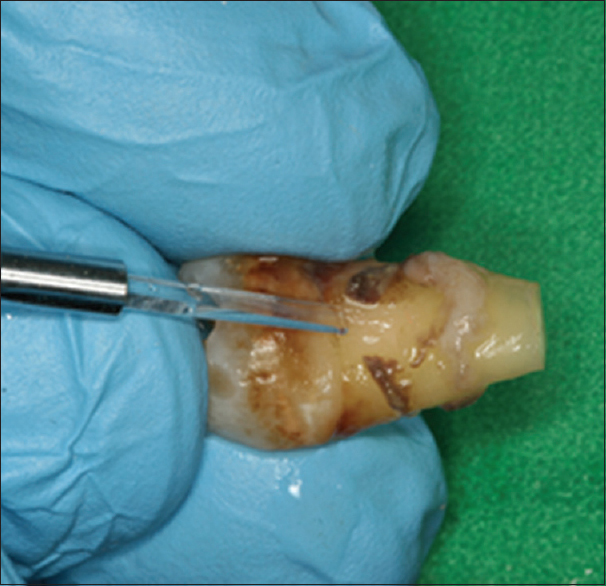 The periodontal clinical examination included the number of missing teeth, plaque index, gingival index (GI), probing pocket depth, and clinical attachment level (CAL). Results: Mean number of missing teeth per patient was 1.14 (±1.2 standard deviation [SD]) in the control group and 2.58 (±1.64 SD) in case group (P < 0.001). 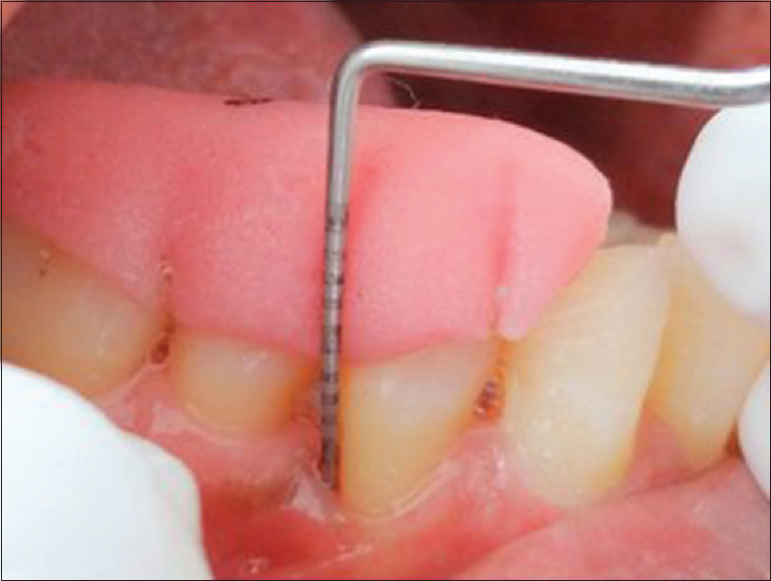 The amount of plaque was significantly higher in cases compared with control (P = 0.001). The patients had an average GI of 1.82 (±0.65 SD) compared to 1.14 (±0.81 SD) for the controls (P < 0.001). Mean probing depth and CAL were 4.67 (±0.8 SD) mm and 4.96 (±0.2 SD) mm in the case group and 2.6 (±2.2 SD) mm and 2.7 (±0.43 SD) mm in the control group, respectively (P < 0.05). Conclusion: Our study confirms the significant association between depression and periodontitis and depression can be considered one of the important risk factors for periodontal diseases. 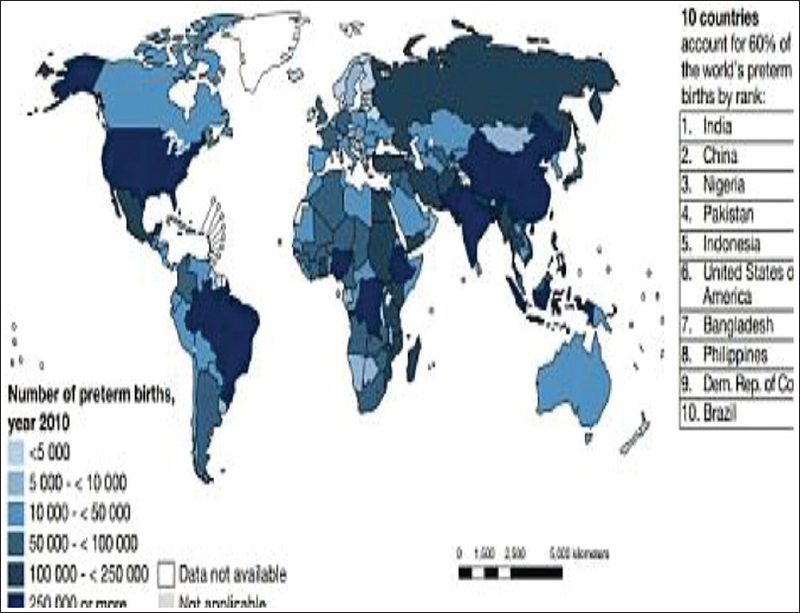 Background and Objective: Preterm birth (PTB) is an important issue in public health and is a major cause for infant mortality and morbidity. There is a growing consensus that systemic diseases elsewhere in the body may influence PTB. Recent studies have hypothesized that maternal periodontitis could be a high-risk factor for PTB. The aim of the present study was to investigate the relationship between maternal periodontitis on PTB. Materials and Methods: Forty systemically healthy primiparous mothers aged 18–35 years were recruited for the study. Based on inclusion and exclusion criteria, they were categorized into PTB group as cases and full term birth group (FTB) as controls. PTB cases (n = 20) defined as spontaneous delivery before/<37 completed weeks of gestation. Controls (FTB) were normal births at or after 37 weeks of gestation. Data on periodontal status, pregnancy outcome variables, and information on other factors that may influence adverse pregnancy outcomes were collected within 2 days of labor. Data were subjected to Student's t-test and Pearson's correlation coefficient statistical analysis. Results: Statistically significant difference with respect to the gestational period at the time of delivery and birth weight of the infants in (PTB) group (<0.001) compared to (FTB) group was observed. Overall, there was statistically significant poor periodontal status in the (PTB) group compared to (FTB) group. The statistical results also showed a positive correlation between gestational age and clinical parameters. Conclusion: An observable relationship was noticed between periodontitis and gestational age, and a positive correlation was found with respect to PTB and periodontitis. Further studies should be designed to establish periodontal disease as an independent risk factor for PTB/preterm low birth weight. Context: Bone grafting materials which have an inherent anti-microbial property against initial colonizers of plaque bacteria would be useful in regenerative periodontal surgical procedures. Aims: This study was performed to analyze the antibacterial property of a Perioglas™ against a common oral commensal Streptococcus salivarius (early colonizer). Settings and Design: In vitro observational study. Materials and Methods: Perioglas™ (in various concentrations) was assessed for its antibacterial property against the ATCC 13419 strain of S. salivarius. The anti-microbial activity was analyzed in terms of reduction in colony-forming units in culture plates and smear following a 24 h incubation at 37°C. Statistical Analysis Used: Observational study - No statistical analysis applicable. Results: The bioactive glass (BAG) exerted an antibacterial effect against the S. salivarius in the suspending media and smear. The antibacterial activity of BAG increased in proportion with its concentration. Conclusions: Perioglas™ demonstrated a considerable antibacterial effect against S. salivarius at 50 mg/mL concentration. 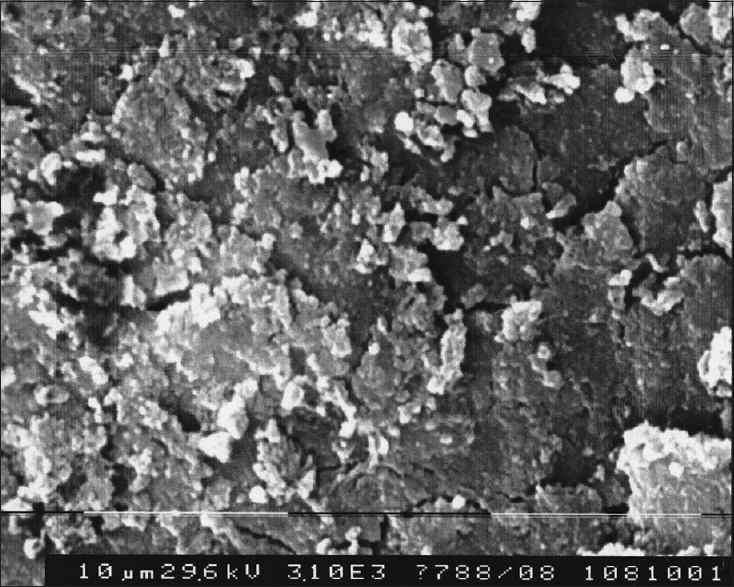 Aim: The purpose of present study was to investigate the scanning electron microscopic alterations produced on scaled and root planed dentin surfaces after application of different etching modalities namely citric acid, tetracycline hydrochloride and ethylenediaminetetraacetic acid (EDTA). Materials and Methods: Eighty specimens of teeth were collected and categorized into four groups. In group 1, control group specimens were treated with normal saline for 3 min, group 2 specimens were treated with citric acid, group 3 specimens were treated with tetracycline hydrochloride for 3 min and group 4 specimens were treated with 15% EDTA. Results: Opening of dentinal tubules was seen in all specimens except for control group that was treated with normal saline. The total number of tubules seen was highest in citric acid group as compared to tetracycline hydrochloride and EDTA Group. The total number of patent tubule opening was highest in citric acid as compared to EDTA and tetracycline. The diameter of patent dentinal tubules in citric acid group was more than EDTA and tetracycline. Conclusion: The study showed that all the three agents were effective in removing the smear layer however number of patent and wider diameter dentinal tubules was seen in vitro best in citric acid than EDTA and then in tetracycline hydrochloride. Hence, citric acid group is more efficient than EDTA and tetracycline HCl group in removing the smear layer and in opening of number of patent dentinal tubules. Aim: To indigenously prepare a chair-side test kit for investigating and comparing the matrix metalloproteinase (MMP)-8 levels in gingival crevicular fluid (GCF) and saliva in patients with healthy periodontium, gingivitis and chronic periodontitis in smokers and nonsmokers. To validate the diagnostic accuracy of indigenously prepared chair-side test against enzyme-linked immune-sorbent assay (ELISA). Furthermore, to assess the effect of nonsurgical periodontal therapy (NSPT) on the levels of MMP-8 in GCF and saliva among the test groups. Materials and Methods: GCF and saliva were collected from 250 subjects. The study population were divided into five groups; health periodontium-nonsmokers (Group 1; n = 50), chronic gingivitis-nonsmokers (Group 2; n = 50), chronic periodontitis-nonsmokers (Group 3; n = 50), chronic gingivitis-smokers (Group 4; n = 50), chronic periodontitis-smokers (Group 5; n = 50). 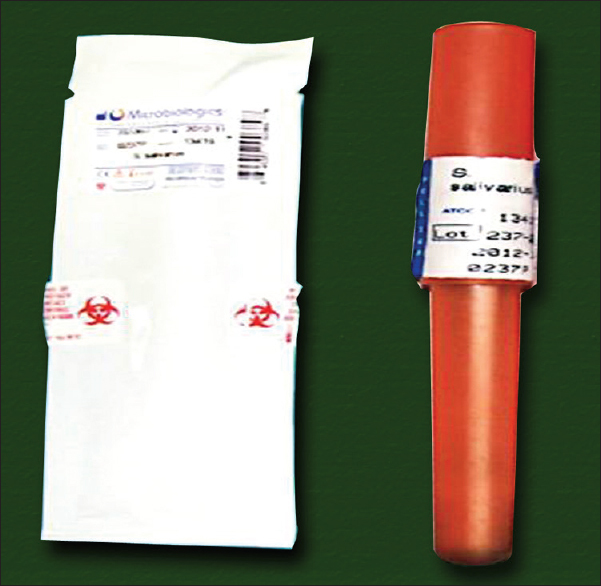 A chair-side test kit was indigenously prepared using polyclonal antibodies (principle of immunochromatography) to detect the MMP-8 levels, and it was validated against ELISA at baseline and 3 months after NSPT.Results: The chair-side test detected MMP-8 levels with a sensitivity and specificity in accordance with ELISA. MMP-8 levels at baseline were higher in Group 2 and Group 3 as compared to controls (P < 0.05), and decreased after therapy (P < 0.05). MMP-8 levels in GCF were greater than in saliva for all the groups, indicating GCF to be a better sample to detect the MMP levels.Conclusion: The chair-side test detected MMP-8 levels accurately making it a viable chair side diagnostic tool. It was effective for early diagnosis of the periodontal disease among high-risk population such as smokers. Background: Myeloperoxidase (MPO), the most abundant protein in neutrophils, is the focus of inflammatory pathologies. MPO could participate in the initiation and progression of periodontal disease. Materials and Methods: A total of 60 patients with healthy gingiva, gingivitis, periodontitis between age group of 20–55 years were selected. 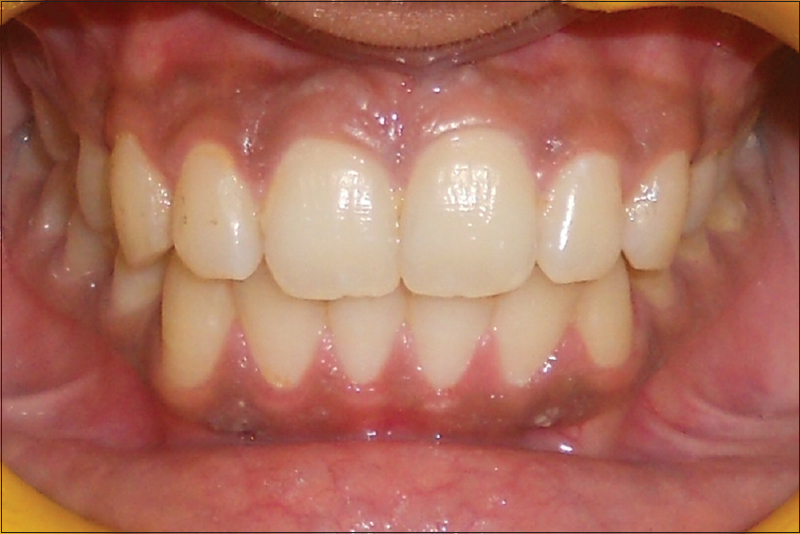 Group I - 20 Patients with healthy gingiva, Group II - 20 Patients with generalized gingivitis, Group III - 20 Patients with generalized chronic periodontitis, Group IV - 20 Patients of Group III after 1-month of scaling and root planning. The following parameters were recorded: Gingival index, plaque index, bleeding on probing index, probing pocket depth, clinical attachment level, salivary MPO levels. All the parameters were then statistically analyzed. Results: The mean MPO levels in Group I recorded was - 0.320 + 0.06, Group II was - 0.183 + 0.04, Group III was - 0.814 + 0.08 and Group IV was - 0.386 + 0.08 respectively. All these values were statistically significant when compared between the four groups (P < 0.05). A significantly elevated salivary MPO levels were found in subjects with chronic periodontitis as compared to the gingivitis group and the healthy group (P < 0.05). However, moderate but statistically significant increase in the MPO levels were observed in the gingivitis group as compared to the healthy group (P < 0.05). Furthermore, significant reduction in MPO levels were observed in Group IV after 1-month of nonsurgical periodontal therapy. Conclusion: The activities of MPO enzyme were significantly increased in the saliva of patients with periodontal disease in comparison to healthy individuals. Furthermore, nonsurgical periodontal therapy was found to be effective in improving clinical parameters and in reducing MPO levels. Salivary enzymes like MPO could be considered as a biochemical marker of periodontal disease activity. Background: Obtaining predictable and esthetic root coverage has become an important part of periodontal therapy. Several techniques have been developed to achieve these goals with variable outcomes. 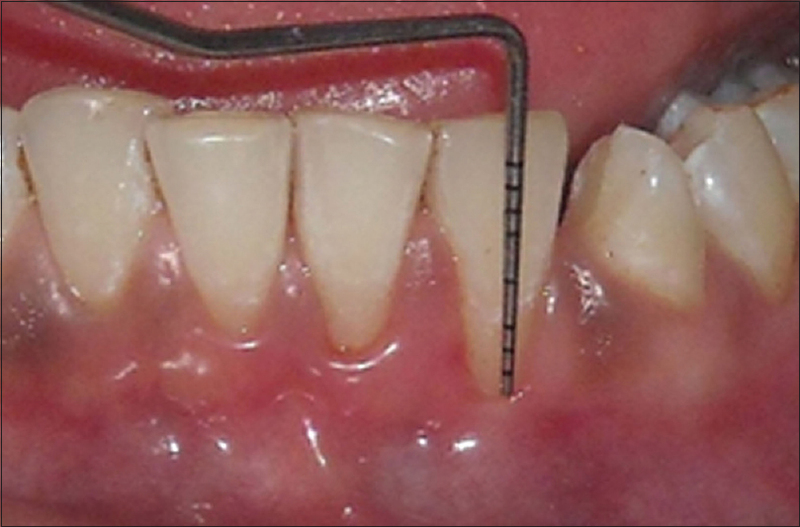 The aim of this study was to appraise the effectiveness of acellular dermal matrix allograft (ADMA) and subepithelial connective tissue graft (SCTG) compared to coronally advanced flap (CAF) in the treatment of multiple gingival recessions. Materials and Methods: A total of 30 patients aged between 18 and 50 years, with multiple Miller's Class I and II recessions on labial or buccal surfaces of teeth were selected for this study. The patients were randomly assigned to CAF + ADMA, CAF + SCTG and CAF groups with 10 patients in each group. 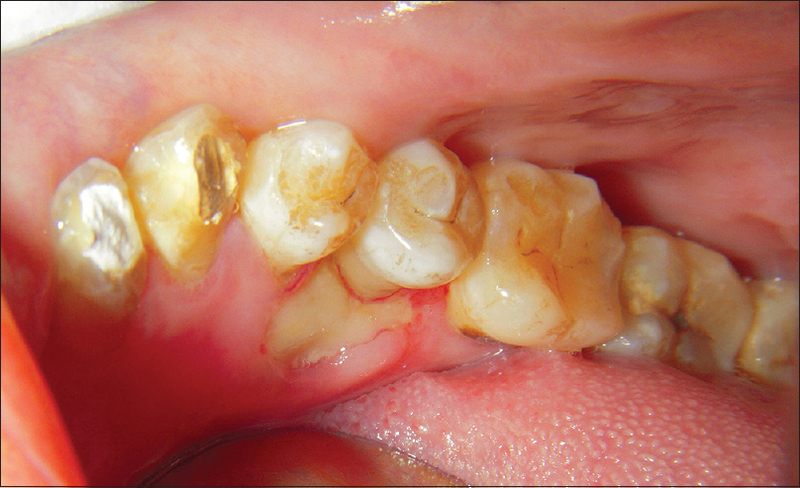 The clinical parameters assessed were probing pocket depth (PPD), clinical attachment level (CAL), gingival recession (GR), width of keratinized tissue, plaque index and papilla bleeding index at base line and 6 months after surgery. Results: Statistical analysis using One-way ANOVA suggested that the root coverage obtained was greater in the ADMA + CAF (89.83 ± 15.29%), when compared to SCTG + CAF (87.73 ± 17.63%) and CAF (63.77 ± 27.12%) groups. The predictability for coverage of >90% was greater in CAF + ADMA (65%) when compared with SCTG + CAF (61.66%) and CAF (31.17%). Improvements in the clinical parameters from baseline were found in all the three groups treated. Conclusion: It was concluded that all three techniques could provide root coverage in Miller's class I and II gingival recessions; but greater % root coverage and predictability for coverage of >90% could be expected with CAF + ADMA and CAF + SCTG groups when compared with CAF alone. Background: Calcium sulphate(CS) is one of the oldest alloplastic graft materials used because of its biocompatibility, handling characteristics, porosity, different rates of dissolution, chemico-physical resemblance to bone mineral, ability to induce release of growth factors and potentially unlimited supply at a modest cost. Aim of the study was to evaluate the efficacy of 3 forms of calcium sulphate i.e. Nanogen (nCS)(+), BoneGen(+) and Dentogen(+) in treatment of infrabony defects and to compare their efficacy as bone grafting substitutes. 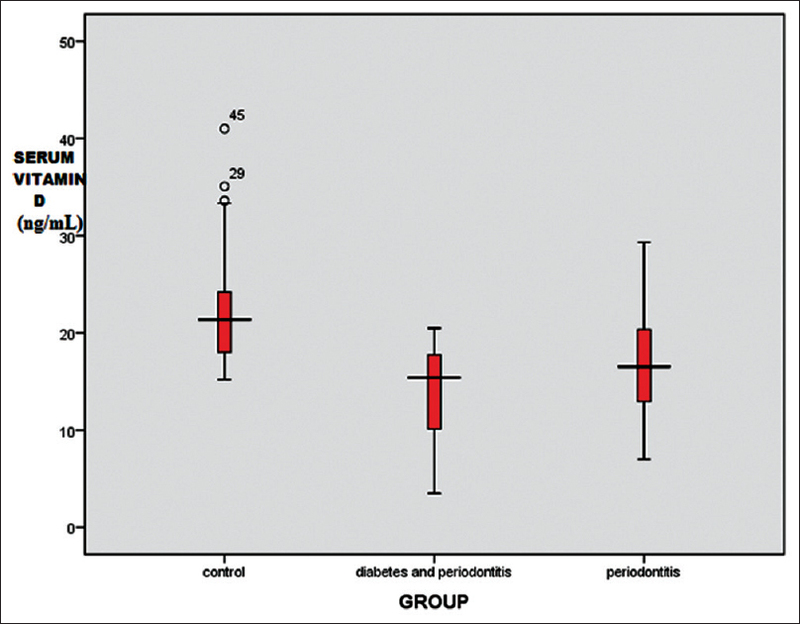 Materials and Methods: A prospective randomized, double blind controlled study was conducted on 45 sites from 16 subjects having Moderate to Advanced Periodontitis who were divided into 3 groups i.e. Group I (Nanogen), Group II (Dentogen) and Group III (BoneGen) clinical along with radiographic measurements were taken at baseline, 6 and 12 months postoperatively. Results: There was no significant inter-group difference in mean clinical attachment level (CAL) values at different time intervals whereas Intra-group changes in CAL at 6 and 12 months as compared to baseline were significant statistically. In Group I, changes in CAL between 6 and 12 months were found to be statistically significant in comparison with Group II and III. Conclusion: Both Nanogen and BoneGen TR can be considered valuable options in the treatment of infra-bony periodontal defects. The faster degradation of Dentogen may negatively affect its bone regeneration potential. Context: In developing countries many chronic conditions including periodontitis are on the rise. Oral health attitudes and beliefs are important factors affecting oral health behavior. 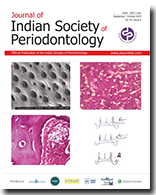 Aims: The aim of this pilot study was to assess the existing knowledge about periodontal disease and its impact on treatment seeking behavior in a group of population visiting the out-patient Department of Periodontics, Yenepoya Dental College, India. This study also attempted to identify deficit in the knowledge if present. Settings and Design: This is a written questionnaire based pilot study. 143 subjects (89 male and 54 female) agreed to participate in the study. Simple random sampling was used for recruitment. Subjects and Methods: A written questionnaire consisting of 18 questions was given to the patients. Only one correct answer was present and the score given was + 1. The knowledge of the subjects was reflected by their ability to select a correct answer from the number of distractors (multiple choices, prespecified answers). Statistical Analysis Used: SPSS software version 15.0 is used for all statistical analysis. The Chi-square test was employed to assess the passive knowledge of the participants in relation to their age. Results: We found a deficit in the knowledge in all the topics investigated. No consistent relationship between age and gender was found. Female respondents had better knowledge about oral hygiene compared to males. Conclusion: We made an attempt to assess the knowledge of periodontitis among the participants of this study. Knowledge deficit was found in the population surveyed. This knowledge deficit could be one of the reasons why patients do not seek periodontal treatment routinely unless there are acute symptoms. There is urgent need to educate the patients about the periodontal disease, the need for the treatment of periodontitis and advanced treatment modalities available. Background: The aims of the present study were to (i) Find the percentage of recession cases that could be classified by application of Miller's and/or Kumar and Masamatti's classification of gingival recession, and (ii) compare the percentage of clinical applicability of Miller's criteria and Kumar and Masamatti's criteria to the total recessions present. Materials and Methods: A total of 104 patients (1089 recession cases) were included in the study wherein they were classified using both Miller's and Kumar and Masamatti's classification systems of gingival recession. Percentage comparison of the application of both classification systems was done. Results: Data analysis showed that though all the cases of the recession were classified by Kumar and Masamatti's classification, only 34.61% cases were classified by Miller's classification. 19.10% cases were completely (having only labial/buccal recession) classified. In 15.51% (out of 34.61%) cases, only buccal recession was classified according to Miller's criteria and included in this category, although these cases had both buccal and lingual/palatal recessions. Furthermore, 29.75% cases of recession with interdental loss and marginal tissue loss coronal to mucogingival junction (MGJ) remained uncategorized by Miller's classification; categorization of palatal/lingual recession was possible with Kumar and Masamatti's classification. 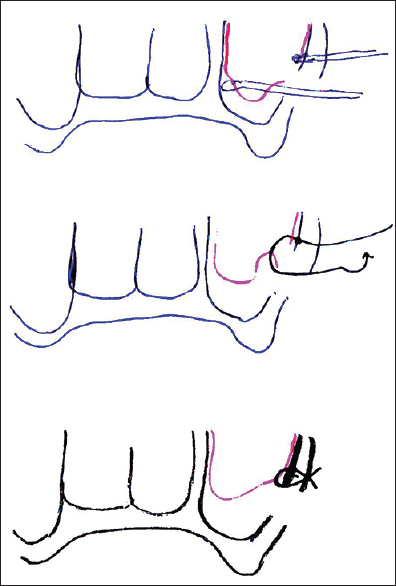 Conclusion: The elaborative evaluation of both buccal and palatal/lingual recession by the Kumar and Masamatti's classification system can be used to overcome the limitations of Miller's classification system, especially the cases with interdental loss and having marginal tissue loss coronal to MGJ. 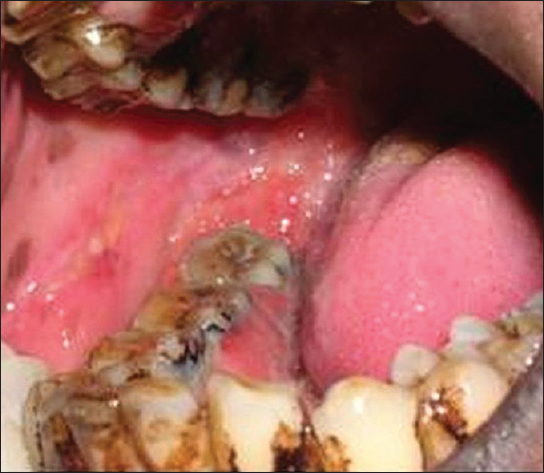 Report of a rare case of contact stomatitis manifesting as irregular erosions partially covered with pseudomembrane along with desquamative gingivitis in a 32-year-old female patient is presented. The patient was otherwise healthy and not taking any medication. She gave the history of using curcumin-based oral gel 2 days back. Allergy test to curcumin oral gel was found to be positive, which on detailed allergy testing proved to be the coloring agent, erythrosine present in the gel. Contrary to the popular belief some folk medicine preparations can lead to unwanted side effects due to the antigenic potential of ingredients present in them. In addition, every clinician, during differential diagnosis of oral lesions must bear in mind unwanted reactions to any local ointment. Burkitt's lymphoma is an undifferentiated non-Hodgkin's B-cell lymphoma. Three clinical subtypes are recognized: African (endemic), American and other areas (sporadic) and human immunodeficiency virus (HIV) associated. Sporadic Burkitt's lymphoma is a rare malignancy among Asian population. 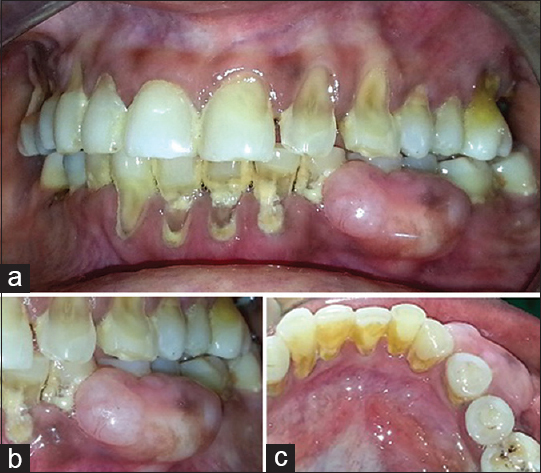 This report describes a case of sporadic Burkitt's lymphoma presenting as generalized gingival enlargement with an alarmingly rapid spread. This type of rapid progression bespeaks the need for prompt recognition and life-saving referral by the dental practitioner. The purpose of this case report and review of the literature was to illustrate the fact that an inconspicuous and benign looking gingival enlargement may turn out to be an aggressive malignancy like Burkitt's lymphoma. Tuberculous lesions affecting periodontium are rare and seen as secondary infections localized to the soft tissues. With the advent of effective drug therapy, tuberculous lesions of the oral cavity have become rare. Involvement of the periodontium has seldomly been reported in the recent literature. We report a case of tuberculous osteomyelitis of mandible affecting periodontium leading to gingival recession and bone exposure in the mandibular premolar region in a 42-year-old female patient. The diagnosis was based on patient's medical and dental history, bacterial culture, clinical and radiographic examination, blood investigation, immunologic tests, histopathologic examination of the tissue specimen. Patient was already taking antitubercular chemotherapy prescribed by physician. Sequestrectomy and decortications were carried out to remove the affected bone. Healing was uneventful and there was no recurrence after 1½ year of follow-up. Antitubercular chemotherapy along with sequestrectomy and decortication are the treatment of choice for tuberculous osteomyelitic lesions affecting periodontium. Sarcoidosis is a multisystem granulomatous disease, which is usually associated with the formation of noncaseating granulomas in affected tissues and organs. It is mostly present with bilateral hilar lymphadenopathy, pulmonary infiltration, ocular, and cutaneous lesions. Oral manifestations of this disease are relatively rare. 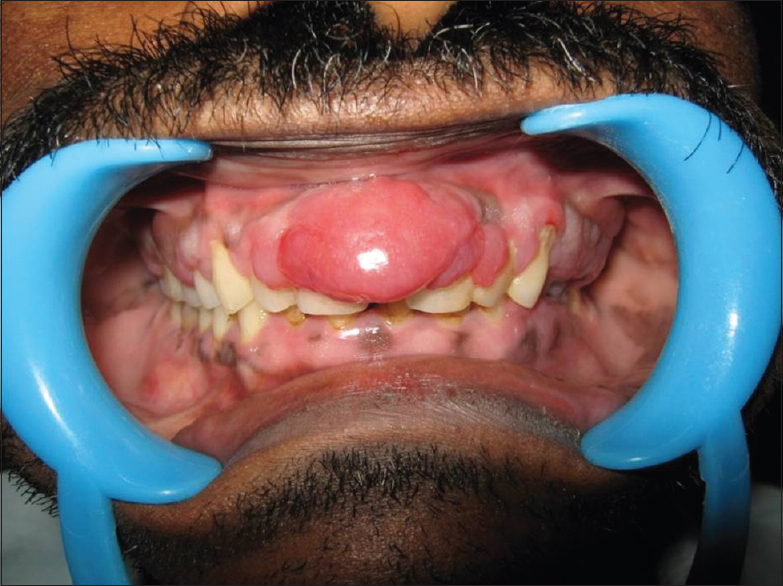 The present case report shows a 40-year-old male with lesions in the soft tissue of oral cavity (buccal mucosa, gingiva, and palate) and a diagnosis of sarcoidosis was established following hematological, biochemical and pulmonary function tests, chest radiograph, and histopathological investigation. A new concept of tele-periodontics, which merges the innovative technology of telecommunications and the field of periodontics, is proposed. This new field of tele-periodontics will have an infinite potential where access to a specialist will be provided at a grass root level, enhancing effective delivery of therapy and information to the rural and under privileged areas. 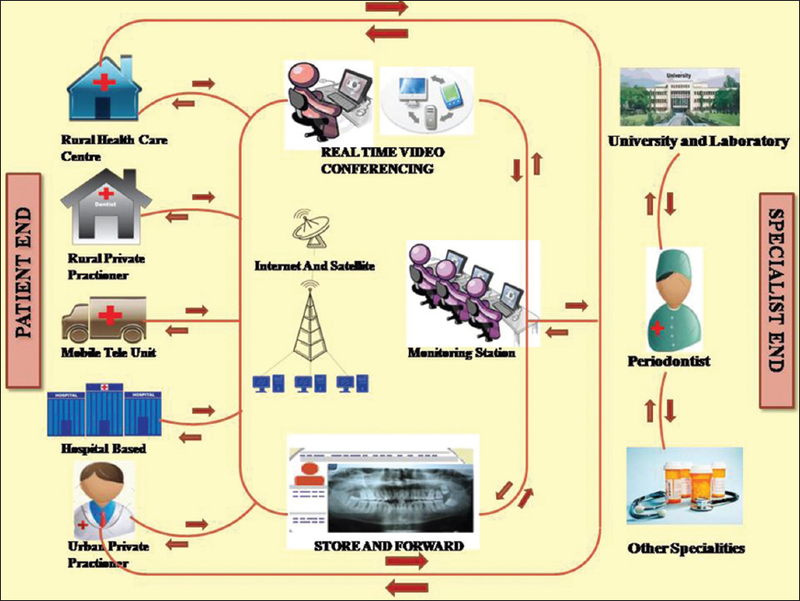 It would allow the specialist and the patient to interact either by video conferencing (real time) or through supportive information (store and forward) over geographic distances. Different probabilities of tele-periodontics such as tele consultation, tele training, tele education and tele support are also discussed in this paper. Bone suture in lateral sinus lift has four indications. Three of them depend on creating a hole in the lateral maxillary sinus wall above the antrostomy window for securing the elevated medial maxillary sinus membrane to manage perforated Schneiderian membrane. Covering the buccal antrostomy window with the buccal fat pad (BFP) for better nourishment of the inserted graft and as an alternative for bone tags in fixation of collagen membrane has been reported previously. A new indication for firmly anchoring the BFP to the medial maxillary sinus wall as the last resort for the management of perforated Schneiderian membrane is explained in this article.